Warning: This recap includes spoilers for Episode 6 of "Star Trek: Discovery." The Vulcans are one of the most beloved races of "Star Trek" because they demonstrate the eternal fight between logic and emotion that each human has. In this episode, we get to see the nasty side of this fight, courtesy of flashbacks involving Sarek (James Frain) — the Vulcan who raised the human girl Michael Burnham (Sonequa Martin-Green) alongside Spock, a beloved character from the "Star Trek" franchise. Fortunately for Burnham, she works under a captain who likes making his own rules. 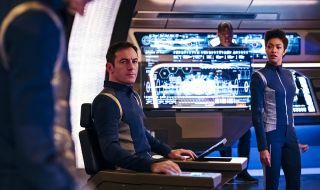 Gabriel Lorca (Jason Isaacs) agrees to a rescue mission to the nebula in which Sarek is stranded. But as we find out during the episode, Starfleet is getting impatient with Lorca's blatant disregard of procedure. For fans impatient with the wobbly science of the last two episodes, Episode 6 finally gives us a break from tardigrades, mushroom spores and lightning-fast travel. This episode is all about politics and family relations — the stuff at which "Star Trek" excels. Let's warp into the episode's details. We learned in the last episode that Lorca blew up the previous ship he commanded, the USS Buran, instead of allowing his crew to be captured by the Klingons, who torture and kill their prisoners. When Lorca disregards Starfleet's wishes and mounts a rescue expedition for Sarek, Adm. Cornwell (Jayne Brook) pays a personal visit instead of just a hologram phone call. The visit actually gets quite personal; the two have a romantic past of some sort, and Lorca charms Cornwell into bed. But the gentle mood is quickly shattered when Cornwell touches the sleeping Lorca's back and he wakes up intent on killing; he chokes her and holds a phaser pistol to her head. Lorca quickly apologizes, but Cornwell says she knows his game now. He's been lying on the Starfleet psychological tests and pretending he's fit to be captain, even though the Buran and the events of the last episode, in which Lorca himself was tortured by Klingons, are greatly affecting his mental state. Cornwell eventually takes over Sarek's role in brokering negotiations with the Klingons, warning Lorca that she is going to find a way to get him out of the captain's chair soon (while preserving his dignity). Unfortunately, the Klingons weren't planning to parlay; they capture Cornwell. A chastened Lorca closes the episode by saying he will follow Starfleet procedure this time and ask what to do, despite the urging of his loyal first officer (Saru, played by Doug Jones) to seek creative alternatives as usual. Meanwhile, Burnham is on her way to rescue Sarek in a tiny shuttle. Burnham spies on Sarek's mind long-distance using a "neural enhancer," and sees one of her greatest failures playing out over and over in Sarek's mind. Turns out that many years ago, Burnham applied to the Vulcan Expeditionary Group. Sarek informed her she failed the tests — because she was too human, of course — but she could apply to Starfleet instead. As she watches the memory repeat, Burnham knows something is wrong. She keeps asking Sarek to help her, but he keeps fighting her and telling her to leave him alone, breaking the mind link. Burnham asks her shuttle crewmates for advice; new security officer Ash Tyler (Shazad Latif, whom Lorca rescued from the Klingons last episode) suggests that on their deathbeds, sentient beings often think of what they'd want to change in their lives. Burnham tries the mind link one last time with that information, and discovers the truth: She actually did pass the Vulcan tests. However, the Group plans to allow only one of Sarek's children in, because neither of them are fully Vulcan. Burnham is human, and Spock is half-human, half-Vulcan. Faced with an impossible choice, Sarek chooses Spock over Burnham. "Star Trek" fans know the long-term result of that choice — neither of Sarek's kids ended up in the Vulcan Expeditionary Group, because Spock chose to be in Starfleet instead of the Vulcan Science Academy. So Sarek regrets his choice deeply. Burnham is resentful, but understanding; when Sarek is finally safe in the USS Discovery's sickbay, Burnham urges Sarek to talk about the situation someday with her. We warned you earlier that many "Star Trek" first seasons are weak. Also, we have to be fair to "Discovery," because the new show is only six episodes old. But looking back at the season's arc so far, long-time fans should feel optimistic. We're seeing characters develop, alliances form, and some neat plots being played out. It's compelling television, and its biggest weakness so far is the badly executed explanations of the spore drive that warps the USS Discovery from place to place. Lorca in particular is coming into his own. We knew right away upon meeting him that something was different about this guy; there was no Kirk derring-do or Picard dignity about him. And now it's clear why. He's got a sad past, so he questions his decisions. He's loyal to his crew, and feels that following the rules puts them in danger sometimes. That's not the kind of captain we're used to as "Star Trek" viewers, but that's great. The franchise was always about diversity, both in opinion and in background. I still feel as though Burnham's character is finding her feet — most situations still are happening to her instead of being affected by her — but episodes like this are a great step toward finding out more about her motivations. So now we know why she's got such a protective shell around herself; her own family betrayed her. But I want to see more situations in which Burnham makes decisions. To be fair, she couldn't really do so before because she was a convicted felon. But now that she's got a proper uniform again, the best way she can grow as a character is to take command and figure out what to do independently; if she wants to stay with Starfleet, she'll have to do it under Starfleet's rules. Can Burnham excel under the restrictions? I have every hope that she can because, after all, that's the challenge that all of us face in life, in our families and at work. We'll see how she does in future episodes.